Next to the search for the best blue ink, black is a colour of ink that can be a defining benchmark for a manufacturer of ink. 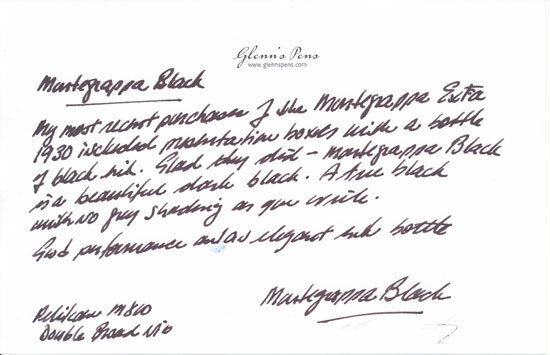 Most, who load their pens with black ink, want a very rich dark black. The blacks with other tones and come out in shadding of ink can look very good on the paper, but generally when it comes to black, a dark colour is sought. I look for deep tone and good flow. I generally write with a broad nib and so if there are undertones to the ink, that comes out as colour variation in the strokes. 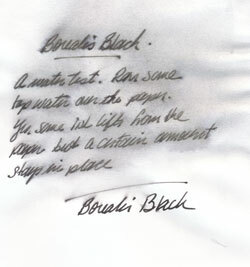 Aurora Black is often used as a benchmark ink. A benchmark for the ranking of other inks in terms of true black colour. I have been using this ink for many years and it still ranks as one of my favourite black inks.. The colour can only be said to be straight black. There are no grey undertones to the ink. Your nib will simply lay a good dark line of ink on the paper. There is no change as it dries. The flow is good, and I have yet to use it in a pen that has difficulty with the ink The ink dries in a reasonable time frame and is not subject to smearing. Overall, this ink is a real winner. 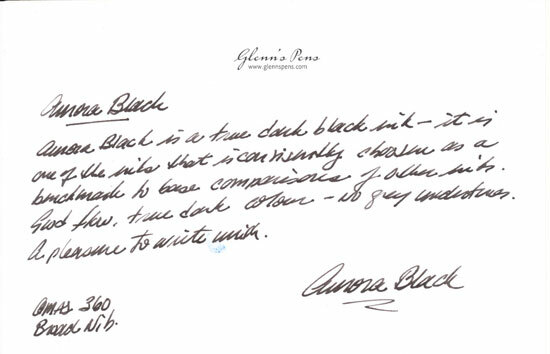 One of the true black inks that many other inks are compared to in terms of a true black ink. Diamine makes a number of black inks and I find this to be the blackest of the group. 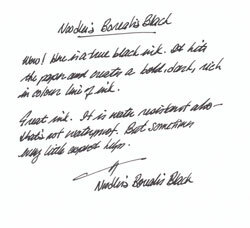 Originally issued in their Old English Line, I have been using Jet Black for a couple of years and it moved into my Inks of Choice because of its rich, deep, true black colour. There are no grey or blue undertones to the ink. I know that some writers have commented on grey tones, but I don't see the grey at all in this ink. Quartz Black, another of the Diamine colours has ever so much warmth, probably a brown, in the ink. Jet Black is a littler colder and sharper in tone. It performs well in just about every pen I try. And nib size is not a factor in performance. I have been using it with broad and double-broad nibs and impressed with the solid line it leaves, no feathering and it dries within an acceptable time - up to 10 seconds depending on the paper and the width of nib in the pen. The ink is not waterproof, so don't buy it if you are looking for a permanent ink that will resist water. 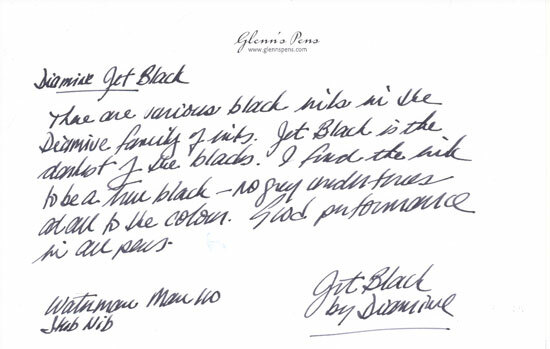 Of the blacks produced by Diamine, I would rank Jet Black as one of the darkest colours. This is a great black. It has good flow and leaves a nice dark, saturated black line of ink as your form your letters. So not only is the colour great, very dark, and not problem in terms of performance, but it comes in a very elegant ink bottle. A very good true black ink. Now here is a black ink. The colour is so deep it is a stunning ink to write with. It is a rich black, full stop. No colour undertones of any type. I have been using the ink in various pens and the flow seems very consistent. The dry time is reasonable and the ink is not subject to smearing or leaving any type of sticky feel to it on most of the papers that I have used with the ink. The ink is water resistant, that is different from water proof and I wanted to see that it would be like when something I wrote with got wet. So I wrote on a piece of paper. Waited about twenty minutes and then took the paper and turned the sink tap on. As you can see from the image to the left, yes ink lifted from the paper and flowed across the paper. A fair amount, however, remained on the paper. So some raindrops or condensation from a wine glass... my biggest fear... would not totally wipe out what had been written. Noodler has true water-proof ink - they call the lines bullet-proof. This is not one of them but performs very well in normal writing conditions. A very dark true black, not water proof, but good water resistance. 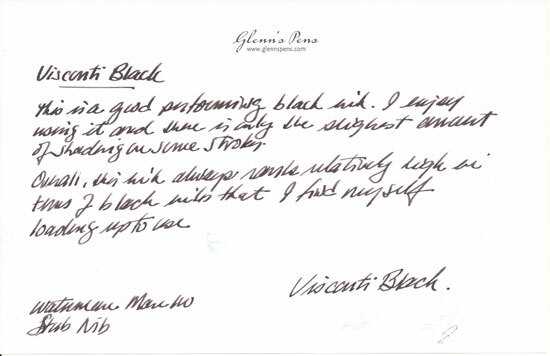 Brilliant Black is a suitable name for this ink. This is one of the dependable inks that most people have in their collection of inks. Pelikan, also makes ink for other companies so you will see the similar bottles and colours labeled for others, such as Cross. It is a good solid true black colour. It has a dependable flow and leaves a good solid tone of black on the paper. Even with a stub or broad nib, a wide line of ink is left and there are no colour changes. In terms of performance. Flows well in many different types of pens. The scan above shows some of the dry times. I wrote the word, waited five or ten seconds then ran by finger through the ink. This is kind of what happens when I write at work. 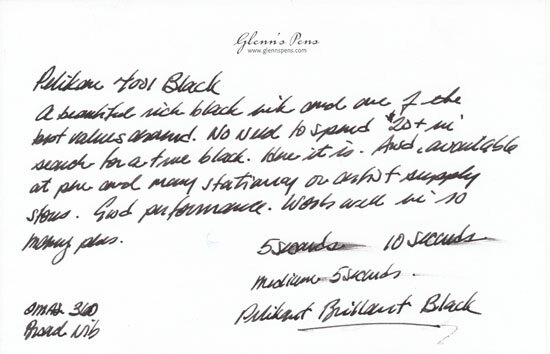 The first line shows the results of writing with a beautify broad and flowing OMAS 360 nib. Both the five and 10 second samples have some smudging. The next example, on the line below, is written with a Delta 365 Medium nib and there almost no smudging. This illustrates the point that the size of nib does have a factor to play in the time it takes for ink to dry. So before you spend $20+ on a bottle of ink, like Pelikan's Edlestine Ink, remember that this ink, at much less per bottle, is one of the best buys in terms of ink you can make. One of the best buys in Black ink - price and colour. A good black, although there is a touch of grey to the colour. It is a good performing ink and I enjoy the unique ink bottle that Visconti holds a patten. The ink has good flow and works well in a range of pens.